The terms “drain relining” and “no dig technology” refer to installing, renewing, and repairing underground pipes in a way that is much less invasive than traditional methods. Underground pipes, cables, and ducts can be repaired with these methods using techniques that eliminate the need for excavation. This means that a pipe can be cured in place rather than dug up and replaced. There are a number of benefits to choosing this method, which we will go into later. Drain relining can also be called no-dig technology, or even trenchless technology. The fact that there’s no need to dig up the earth/pipe is one of the major pros in choosing this method for sewer or drain repair. With this type of drain relining, there is minimal disruption to your surface and the environment, causing less hassle and inconvenience overall. There are also fewer health and safety risks, meaning that this method is becoming all the more popular in both commercial and domestic circumstances that require repairs of this nature. Although used in many industries, this method is particularly useful in a plumbing career. ● Higher Quality of Work – state of the art equipment and high quality materials are used by expert plumbers to carry out the drain repairs. This will leave you with a more durable system in place that could last more than 50 years. ● Greater Time-Efficiency – this technique can take just a few hours to complete, and your pipes may be like new once finished. ● Cheaper Costs Associated – you could save up to 75% in costs. ● Versatile – this technology can work for all kinds of pipes, providing they are not damaged beyond repair. ● Eco-Friendly – you will also save the planet as well as saving money. ● Durable – the pipes lined with the epoxy resin used in the techniques can last up to 50 years. It’s the most efficient method of fixing broken sewer pipes, and one of the best investments you can make in terms of the benefits. Bear in mind that there may be the odd occasion where it’s too late to save your pipe system using this method. If the sewer line is damaged and corroded beyond repair, then you may still need to dig up your trenches in order to have new pipes fitted. You will need to discuss with a professional before proceeding with the no dig technique. When Should You Use No-Dig Technology? This method can be used for all types of pipe work, providing the pipes measure 75mm and above in diameter. This work will be carried out with minimal disruption to your property and is much faster than the traditional methods used. It will only not be used if the drain line has deformed, collapsed, corroded, or suffered some other type of irreparable damage. This no dig technology can even be used to restore cracks, holes, fractures, and breaks with the use of patch liners. You can potentially extend the life of your current drainage system and get rid of the need to replace the line altogether, which is quicker, smarter, and far cheaper. You can expect less hassle and cost when you choose this method. The techniques used are cost effective and particularly useful if the faulty drain connection goes below an extension. If excavating the spot would cause too big of a disruption, then it makes another great choice. You will not need to worry about any upheaval at home or waste generation that usually comes with digging and excavation work. You will find that no dig technology is very popular among customers in domestic properties, as well as highway construction agencies who use this method on the road’s primary drains. It can be used in a number of applications, as the benefits of the method are so vast and versatile. When you consider what is most expensive of traditional dig and replace pipe repair, it’s usually the labour, displacement of earth, and the hours spent restoring your broken pipe. It isn’t all about the materials and the tools used. 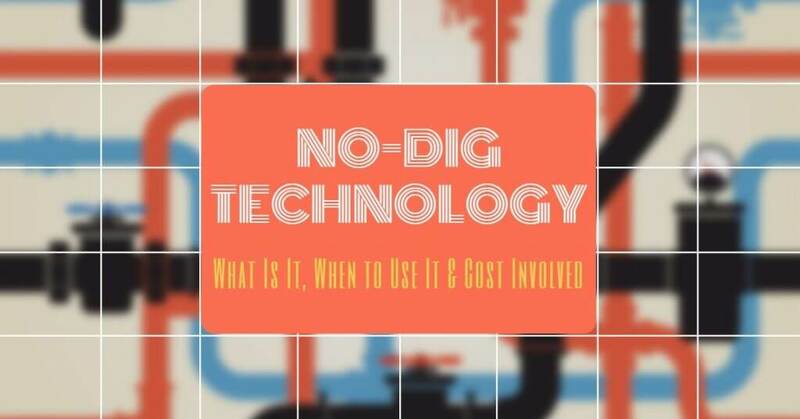 As pipes using no dig technology are cured in place without all of that chaos and excavation, you will typically spend anywhere from 25-75% less on the work that must be done. It’s a great solution for just about anybody who needs their pipe work taken care of. Blocked Drain Causes & Prevention : Why Is My Drain Blocked?